Looks like a lovely cutting board for chopping ingredients for my special guacomole: avocados, red onion,jalapenos (or serranos), and lime. The key is making sure the avocados are just ripe enough. I love the chopping board! It's great! I eat a lot of vegebables in my pasta, so this would be a great board to cut everything up on in one go. Totally chopping green onions and spinach for spinach dip. I will be cutting bread and also chocolate bars for homemade chocolate chips for cookies. I also chop up bigger chunks of veggies in my Gazpacho in the summer. I see myself cutting up my veggies and herbs for my sofrito. I'd be cutting sweet potatoes for my sweet potato fries! What a great giveaway! I would be cutting up sweet potatos for fries. Yum! I'd be slicing steak to make hamburger in my new meat grinder! Jalapenos! I put them in everything my husband will allow me to get away with! Fresh herbs from my flourishing garden! I'm thinking a basil pesto is on the menu. Onions and garlic! I put them in everything! I would be using the cutting board for making all of our meals. From kneading bread dough to chopping onions. Cool cutting board! It would mostly be used for cutting veggies for salads. Beautiful. I'd use every day. what a congo! ;) this board would be perfect for when i attempt to make, and eventually slice, my grandma's homemade bread recipe! I will be chopping fresh veggies for a big salad! Well if I had it today I would have been chopping leeks and garlic for my thai beef. This board looks perfect for transporting the dough, and slicing/presenting the loaf, of the James Beard No-Knead Bread! Sorry, only have the recipe in paper form, so no link. My email is ejm6x at yahoo dot com. I'll be chopping green onions for mongolian beef. Onions and garlic! the perfect beginning to any meal. Whatever my wife wants me to chop! I will be cutting tofu, beets, carrots and chopping almonds.... I found this great recipe called, "the glory bowl". Just go to google and type that in....YUMMMMMMMY! Fun First Giveaway!!! Thanks for the opportunity. I'd be chopping veggies and using it when I slice my homemade bread...it's so beautiful! Beautiful board that would make the prep of my chicken squash stew even more fun! Thanks for the chance! I'm a vegetarian, so I would be chopping gazillions of veggies, day in day out! wow this is gorgeous! sure beats the plastic one i use now! i'd use this to chop onions, garlic, and veggies for my minestrone soup. sorry there's no recipie...i just wing it depending on what's available in my kitchen. beautiful! i would use it constantly, but one of my favorites is cutting up zucchini to be fried and cucumbers and lemons to make saucey water--tastes super fresh and is super healthy! Great cutting board.Thank you for this giveaway! I will shopping veggies for a delicius soup! and papaya for a smoothie. I'll be cutting peppers and pineapple for a quinoa stir-fry! Mmmmm first thing I'd use this cutting board for would be chopping dinosaur kale for a family original - Quinoa and Seitan. (We really need to come up with a better name I think). Cooked Quinoa with steamed dino kale and seitan with a ginger soy sauce. Very good, very nutritious! What a great giveaway! I've been looking for a wooden cutting board. I just learned how to make pasta by hand (from a friend's Italian grandmother) and she says the way to make it is on a wooden cutting board. I'd use the board to chop tomatoes and basil for pasta sauce — after making the pasta of course! I'll be cutting avocados for sure. Tomatoes, mushrooms, and chicken are other frequent fliers on my cutting boards. Great giveaway! What a gorgeous cutting board! I'm usually in charge of chopping veggies while my husband cook the meats, so this board will be covered with all kinds of fresh vegetables to be cut! What a wonderful product! 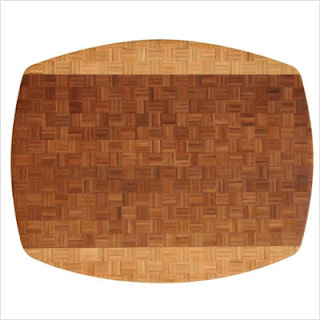 I have an ugly plastic cutting board that desperately needs replacing by a chic new bamboo cutting board! :) I would use it to chop onions, carrots, and celery for my famous lentil soap. Yum! Fabulous! I will be chopping pineapple for my favorite dessert! Ooh, what a useful item! I'd use the cutting board to chop vegetables for this great vegan casserole that I love to make!!! in love with this--how fun to make cooking more fun! Would love to use this to cut up veggies for my salads! Would love to have this for chopping fresh herbs, tomatoes, mincing up some yummy garlic. Our favorite recipe for entertaining is Mexican Bruschetta. Here's a link to the recipe! Funny--my hubby was just saying he wants a new cutting board. We would definitely be cutting up veggies from our garden for salsa. Cheese for my famous cheese/cracker snack trays. I will be chopping ingredients for my wonderful quick and easy beef and veggie soup! Yum! Garlic, onions and peppers. Because that's what I chop up the most. As I add it to almost everything. I cook like crazy! I have a whole blog devoted to all the stuff I've made for the past 5 years. Who knows what bizarre ingredient I'll be cutting from day to day? Tonight it'll be some buttermilk blue cheese and roasted tomatoes to make a soup! I'll be popping on a lovely pink pair of NO TEAR onion specs and chopping a yummy Walla Walla sweet for my Hubby's favorite soup. I'll be chopping lots of carrots & peppers to dip in hummus! I would chop bananas and pecans for my banana pancakes! I would chop fresh fruit and herbs for a fruit salad, my new favorite breakfast/snack/dessert. My name is Aubrey, and I'd be chopping tomatoes, basil, and mozerella for an italian antipasto. SO yummy! Thanks for the giveaway! I cut a lot - apples, pears, carrots for kids and onions, ham and peppers for omelets for me and husband. Veggies, veggies, veggies! Carrots, celery, red peppers, broccoli, cauliflower - for snacks for my kids! i would use it to cut fresh fruits and vegetables! the cutting board we have in our apartment right now is sooo small! thank you, you rock! herbs for dinner! i love, love, love fresh herbs! I will cut EVERYTHING on this board except for raw meat! I will actually use it as a surface for dough making for my bread! I will be chopping up fruit for fruit salad and fruit smoothies! I chop veggies every day! Today a cut up celery, peppers, carrots, onions, and ham for a stew! I'd definitely be chopping sweet onions and garlic, because that's the beginning of so many of my mom's recipes. The smell of sauteeing onions and garlic brings me back home! I'll be chopping a lot of onions! I would use this cutting board for chopping up tomatoes for Salsa! I would use this cutting board for cutting lettuce for salad that is going to be included in a dinner that I'm planning to make for my parents. I make a smoothie almost every morning, and my cheap plastic cutting board is starting to show it. So I'd use it to cut up the fruits and vegetables for my smoothies. Red, tomatoes, and green, peppers out of our garden this spring and summers is what I would chop up on the board. my favorite thing to cut for is sweet potato fries! a healthy alternative to mc donalds or charley's fries! i also add some sea salt for extra flavor! I would be cutting lots of veggies for snacks or salads. Especially onions, we're big fans in this household.